Construction work to install new high-speed Internet and electrical cables under Second and Pratamnak roads will continue for another four months, city officials said. Work began in February on laying fiber-optic cable for CAT Telecom’s new “fibre to the home” project. 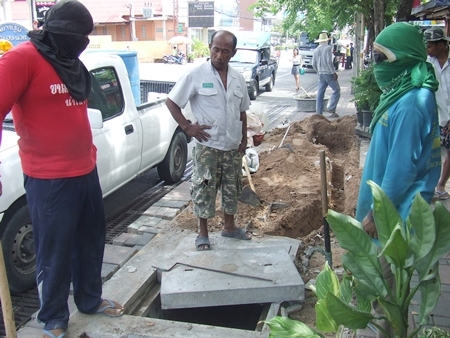 On July 18 crews were working on seven connection stations between Second Road and Soi 3 to Pratamnak Road. In addition to the data cables, electrical substations are being added to ensure steady 22 kilovolts of power for the city and remove many of the ugly overhead cables. Construction work on Second and Pratamnak roads will continue until November. Work on those seven areas is expected to finish sometime this month with the entire first-phase of CAT’s network expected to be laid by November. City officials said traffic signs and warnings have been installed to inform drivers of the construction.